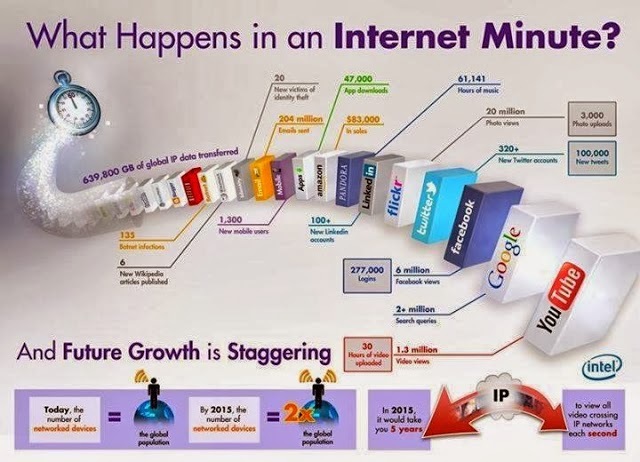 Twinpine Blog: What Happens in 60 Seconds on The Internet? Have you ever wondered how much activity goes on over the internet these days? With the current surge in internet engagement by virtually everyone from students and professionals to big brands and celebrities powered by social networks, a lot can happen literally within the blink of an eye. In a recent study, Programming Geeks recently described what goes on within a minute on the internet across social media and the figures were quite interesting. Within one minute FaceBook has about two hundred and seventy seven logins and about six million page views. In that same time about two hundred and four emails have been exchanged and twenty million photo views on Flickr. Probably before you are through with this article 1.3 million videos would have been viewed on YouTube. It’s just a testament of how ubiquitous the internet has become and how much opportunity it holds for consumer awareness and engagement.